My mom made this salad a lot while we were growing up. She made the dressing from scratch, but you can save some time and buy a bottle of poppy seed dressing instead. I don't know what it is about the combination of spinach and poppy seed dressing, but it is oh so good. 1. Mix all ingredients and enjoy! YUM! All the recipes you just posted look delish! mmm yum, I have some spinach in the fridge. Thanks for sharing your recipe! This looks so good. I heart salads with bacon. 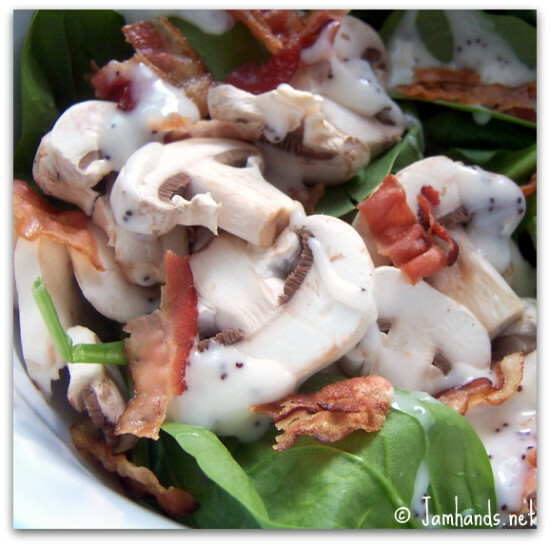 Love spinach salads and yours looks fab! I wish that I could dive right into it, right now! Have a great weekend!! Yummy! Our Best Bites has a Sweet & Salty Salad Wrap that is basically this salad, with chicken, in a tortilla. I thought it was really good! Thank you for following my blog. I am looking forward to links with you in the future. I am a softy when it comes to spinach salads. They are so versatile and yummy. Mmm! I love spinach salad! Anything with bacon is the best!